Facebook delivered a stunner of an earnings call on July 25, signaling slowing growth through the balance of 2018. Based on Facebook's guidance, we are revising down our total 2018 revenue forecast from $57.5B to $54.2B. We estimate that $50.2B will be delivered on Facebook's owned and operated properties, and the remaining $4.0B will be delivered on Facebook Audience Network. Based on Criteo's latest earnings release as well as feedback from readers, we are revising down our 2018 Criteo revenue estimate from $3.0B to $2.4B. Criteo's growth rate was over 30% in 2017 but has now declined to under 10% in Q1 of this year and even further to -1% in Q2. We expect Criteo's growth to continue to slow substantially as its retargeting business faces headwinds from GDPR, Safari cookie policies, and marketer demands for improved pricing transparency. While not reported in Verizon's public filings, many readers pointed us to evidence that Oath is more challenged than our original projections indicated. We are revising down our 2018 forecast from 5.0% growth to 2.5% growth. At nearly $4.0B of managed programmatic spend plus another $1.0B of reserved campaigns, Oath continues to be an open internet power player, but we believe it will lose market share to the leading DSPs, Google Display Network, and Facebook Audience Network. We continue to think reserved buys are declining, but at a slower rate than we originally estimated. Our revised 2018 forecast has reserved buys declining 29% year over year. We also continue to think that sub-scale DSPs and ad networks will contract in 2018, but again, we're revising our forecast to show a more modest 23% year over year decline. 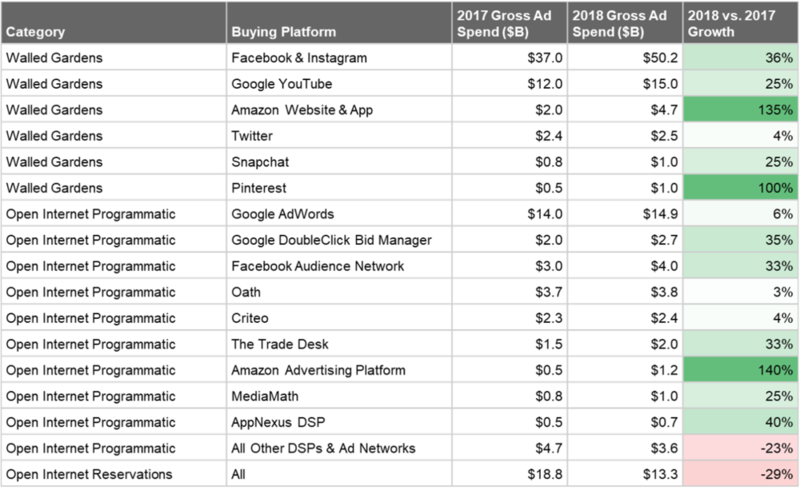 The table below reflects our best current estimate of 2018 digital media spend. For access to our underlying sources and assumptions, send an email to contact@jouncemedia.com. We will continue to revise our projections as we gather new information.